In honor of the 100th anniversary of the birth of Gordon Parks, widely recognized as the most influential African American photographer of the 20th century, Howard Greenberg Gallery in collaboration with the Gordon Parks Foundation will present two simultaneous exhibitions of his work. Contact: Gordon Parks, Ralph Ellison, and “Invisible Man,” curated by Glenn Ligon, and Gordon Parks: Centennial will be on view from September 14 – October 27, 2012. Parks, a remarkable Renaissance man who was also a writer, filmmaker, and composer, brought poetic style to street photography and portraiture, while exploring the social and economic impact of racism. Contact: Gordon Parks, Ralph Ellison, and “Invisible Man,” curated by the artist Glenn Ligon, examines a series of works by Gordon Parks entitled Invisible Man. Many were first published in Life magazine upon the release of Ralph Ellison's award winning novel, which explored racial and social issues facing African Americans in the 20th century. A milestone in American literature, the novel is narrated by a black man who feels socially invisible. 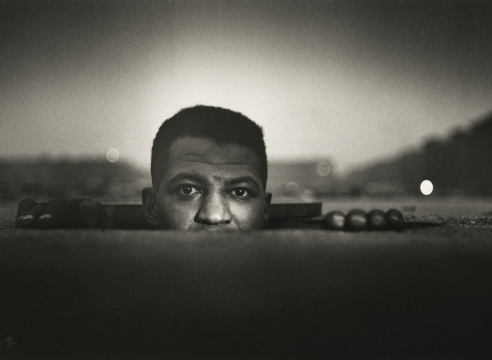 The exhibition includes the gelatin silver print The Invisible Man, Harlem, New York, 1952, a striking image of a man peering out from underneath a manhole cover in the middle of a deserted street.